Maybe it moved him to exit the room . . . . Here's a site with information and many links to further articles about the Gothic. Includes the timings of various performances. So which recording Gothic to we recommend? If there is more than one recording? Besides Lenard's on Marco Polo or Naxos, I've heard rumours that there are boots of Boult's 1966 performance. I've never been able to get my hands on one though. For all practical purposes then, Lenard is it. Not to worry: it's a very good performance, and of course, inexpensive now. Why is this called a symphony, when it's really like a sinfonietta? Ah, to be a virtuoso birdscare player! That would be the life. The bird-scare, long drum and thunder sheet are marked in the instrumentarium, but don't appear in the score; it's conjectured that they are to be played in the final climax[es] of the piece. A relatively common instrument like the celesta, believe it or not, only has a very brief appearance in the score, too. That is indeed an exact likeness of the front row of seats which I remember seeing at the HBS-organised premiere of The Cenci a few years ago. Well, I only attended a HBS London concert with the Violin Concerto and the orchestral music from The Tigers, 12 years ago (1995) - and then the front row still had their teeth. Consider it a lucky escape - it's a real bugger to tune. Fine list my friend, matching recordings? There is only one of each (except the Sinfonia Brevis). 7, 8 and 9 are on the EMi disc I recommend above all; 3 you have ordered; 10 was on Unicorn (the pioneering orchestra is my old youth orchestra, the LSSO! ); the Gothic is on Marco Polo or Naxos (same recording, different incarnations); In Memoriam is on one of the Marco Polo Brian series. For my money any of the first 12 or so Brian Symphonies, in particular, offer the easiest way into his music - 12 very different masterpieces each with its own tone. The larger scale earlier symphonies (1-4 are all huge, with 4 nearly as big as the Gothic in some respects) give way to slightly more modest-sized pieces (though 7 is a very large one too). 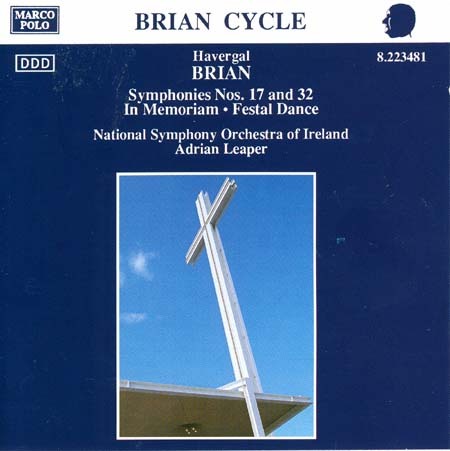 The later symphonies are the models of concision, and very possibly even finer works, , but Brian's undiluted style probably needs assimilating through the earlier works first. One word of advice - in Brian's music it is important to listen to the bass as a melodic line more than in any other comparable composer. No one else makes their trombones, euphoniums, tubas, bassoons and double basses work quite as hard as he does! Thanks for the info, I will act on this and other advise given in this thread. I look forward to the recordings I can lay my hands on. There is a bootleg of Boult's 60's performance I think somebody on this board may have heard it. Surely, the Beeb has tapes of either/or the Boult and the Schmidt, or knows somebody who has? Certainly, there are plenty of conductors, orchestras and record companies around able to process a Brian cycle. In fact, wasn't Marco Polo/Naxos doing this with the likes of Leaper and Friend? In Memoriam is on one of the Marco Polo Brian series. On the ball, as usual. Perhaps we should write to Heyman and ask why the cycle ceased. Leaper would be more than capable. Considering some of the obscure composers hardly worthy of such attention (Hans Huber) that get on disc it is surprising that Brian has not, so far, received his recorded due! dB will be very pleased to hear that. Page created in 0.045 seconds with 32 queries.